"Go away. I don't care for grease-covered roses." Starting off the disc is the first film to feature Keaton after his brief World War I service, Back Stage (1919). This short includes a great many routines from The Three Keatons' act, and is also a forerunner of Keaton's later The Playhouse. John Coogan is featured as a weird novelty dancer, and a Strong Man is in the cast as well. Fatty is a paperhanger (with a very funny scene trying to put up a poster as a little kid keeps getting in the way) and Buster is a stagehand. When they cross the Strong Man, who abuses his female assistant, the whole troupe quits and leaves them to put on the show by themselves. The resultant performance is zany and quite comical, but the old troupe comes back to heckle...and the Strong Man is primed for murder! Good Night, Nurse! (1918) is one of the best Arbuckle vehicles, with one of his funniest performances in drag. The inebriated Fatty is committed to the No Hope Sanitarium, which advertises a surgical cure for alcoholism. Buster is featured as the surgeon, appearing in a rather terrifying blood-smeared smock. Fatty attempts to escape (and to aid Alice Lake in escaping as well), dressed in the uniform of a hefty nurse, but of course things go badly wrong. The humor of this short is somewhat tempered by the knowledge that both stars would end up alcoholics themselves (though Keaton would manage to kick the habit). In Coney Island (1917), Fatty really lets loose, ditching his wife by hiding in the sand, stealing Al St. John's girl, getting Buster thrown into the water, dressing in drag, winding up in jail and knocking out all the police and then locking his furious wife in the cell herself! There's plenty of mayhem on the midway here. Another purely knockabout short is The Rough House (1918). Fatty stars as Mr. Rough, whose household help (including Al St. John and Alice Lake, as well as Buster) is less than competent. When the help begins a knockdown fight, Fatty is soon in it too, and the house is more or less demolished in the first reel. St. John is at his best here as the homicidal cook; one truly believes he's completely mad. When Mrs. Rough and her mother return home, Fatty finds himself demoted to cook himself. The story somewhat drags with the addition of two phony dukes who mark the house for theft, and Buster and Al's reappearance as police, but the first half of the film is as funny as anything I've seen. 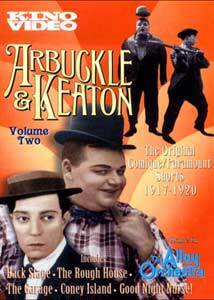 Winding up the program is The Garage (1920), the final Arbuckle-Keaton collaboration. Here we see Keaton really graduate to full-fledged co-star, with as much to do as Fatty himself, if not more. The two of them are the local mechanics/dog catchers/firemen, and predictably cause mayhem and trouble with all three of these jobs. Keaton has a very funny bit where he loses his pants to Luke the Dog, then tries to masquerade as a Scotsman, swiping the kilt from a billboard advertising Harry Lauder, a popular Scots vaudevillian. While not as lowbrow as the earlier shorts, it is quite humorous and good for many a laugh. Between these two discs, there's plenty of first-rate slapstick comedy fun to be had. Highly enjoyable, and highly recommended. Image Transfer Review: All of the films on the disc are taken from 35mm masters. The detail visible is often dazzling. There is some flickering and speckling throughout, but these films are over 80 years old and we should be glad they exist at all. The second reel of Coney Island tends to be overly contrasty, and The Garage has a rather washed out appearance. However, they are all watchable. In a few spots, there is dirt and fuzz clinging to the aperture; it's not clear if this is printed into the source or if it was a problem in the transfer to video. Audio Transfer Review: The audio is a newly recorded score composed and performed by the Alloy Orchestra, which has appeared on a number of silent DVDs so far. As befits slapstick comedy, the music is comparable to Danny Elfman's score for Pee-Wee's Big Adventure, and hardly ever stops for breath. Full of rollicking good humor, the score is a definite plus to this transfer. The shorts here also get a somewhat more sentimental and moody score than appears on Vol. One, making for a nice contrast to the wild and woolly music that appears in the rest of the disc. Hiss and noise are nonexistent, and the sound comes through crisply and clearly, with good bass extension.